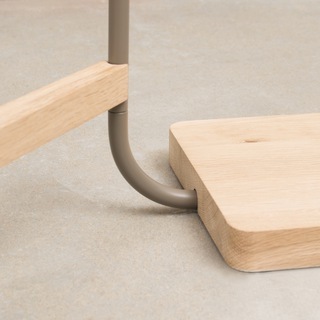 Mutable furniture that invites the user to compose their own personal landscape of objects. 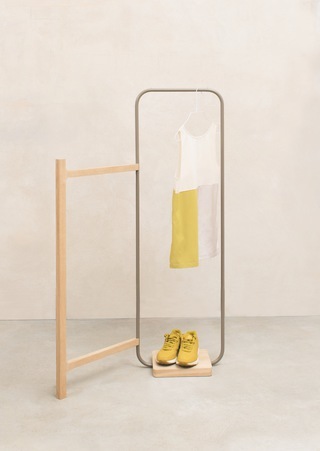 BLANCHE is a clothes stand that offers space to lay, hang up and store clothes in daily use. Its structural elements have been pared down to a minimum: the metal arc serves as a stand for a blazer or a blouse. The wooden counterpart can hold a greater amount of clothes. Blanche most distinctive feature, its mutability, results from the flexible connection of the two arcs. Its structure allows the user to compose their own personal landscape of objects, which takes shape spontaneously according to the habits and identity of the person. Blanche is available in diffrent colors in RAL for the powder coating. For the wooden elements ash wood and oak wood can be selected.